I designed this in openscad, and transfered it to cura. I've done this with several other other designs and never had a problem. It should be smooth not have this weird spiral pattern on it. I don't know what's happening. Is it possible that you accidentally switched on the vase mode? Vasemode woould have left only a single shell. That seems to have thickness. It is weird. It would help to know printer, filament, settings etc. otherwise it was the work of the printergeists at work. I think maybe not enough cooling. Fan is working? 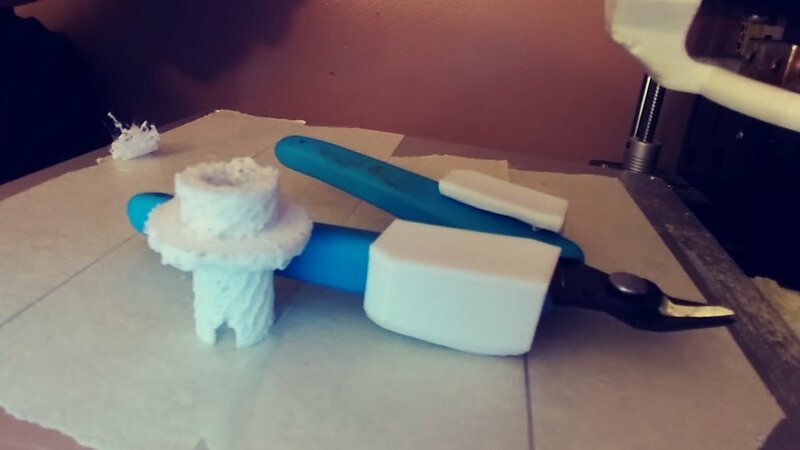 Have the other successful prints had a larger X-Y area, thereby allowing more cooling prior to subsequent layers? Maybe try a combination of slower print time, increasing minimum layer time, and maybe enable Lift Head? I sometimes print 2 or more small area parts to provide more cooling time and pick the best one when its done. To me this looks like some feeder/extruder issues. I would do some atomic/cold pulls. Check the consistency of your filament. Manually push the filament into the hotend to see if the temperature is right. Where would I find vase mode? Here are my printer settings. I'm not sure what filament I'm using, I got it a while ago, but I haven't had any issues in the past with it. Also i am using an anet a8. ummmm, same filament that was successful so far? The reason I am asking is if you went from a low temp filament to a high temp filament, that would create massive underextrusion. The version you show is a previous version that is before my time. Sorry, but there are those who are familiar with it. Yes, when i bought the printer a year or two ago I bought a few spools of the same fillament. Thats all I've ever used. Just ruling out things....have you tried the hot and cold pulls and see if there is a clog? Please show the other settings as well. And can you zoom in on the part more? It looks maybe underextruded but I can't tell. and check your part in layer view - does it look fine there? I can't tell from the photo but the only thing that makes sense to me is underextrusion. Also when you post your settings, tell us what your nozzle diameter is.